After dismantling the Lagers in the SPSL Premier Semi-Final on Saturday at Valley Ridge, the Wolves defeated FC Sheriff 4-1 on Sunday evening to capture the SPSL Premier crown. Over 200 hundred fans were on hand at the Starfire Stadium to watch the final, which kicked-off at 8:00pm on Sunday evening. Equipped with air horns, boom boxes and even one trumpet, FC Sheriff fans made their presence heard even before the opening kick-off. Left to use only their vocal cords, Seattle Wolves fans battled hard in the stands to have their voices heard early on and throughout the entire match. Thanks to all that came out to watch the Wolves win the title and joined us afterwards at the post-match celebration. Through speaking with the players, I know they really appreciated your support. The Wolves gave their fans something to cheer about early in the match, scoring in the 2nd and 6th minutes. The trumpets and air horns were silenced by Mark Conrad and Tim Merritt, and the eastern European national anthem that was playing from a portable radio in the stands was cut short. As soon as the whistle blew the Wolves pressed very high getting the ball to their forwards, and playing creatively off them. It paid off early. A beautifully struck ball from winger, Pedro Batres, gave Thiago Silva the space to slot the ball through to Mark Conrad. On goal, with only the goal keeper to beat, Mark finished calmly. One minute and 11 seconds into the match, Wolves 1, Sheriff 0. Wasting no time getting right back to their game plan, the Wolves quickly regained possession. Pressing forward, Matt Hulen was clipped just outside the box, and a free kick was given in the 6th minute. Hulen and Silva combined for a quick exchange off the restart, and slotted a ball across the top of the box for an on-running Merritt, who struck it cleanly and finished side netting, far post. After the match, players were quoted as saying "That one was for Jack Doughty", one of the Wolves most loyal young fans. The Wolves continued to press high and controlled possession for most of the first half. However, subsequent chances on goal were not converted, and as the half wore on, the Sheriff crowd urged their team to get back into the match. They were rewarded shortly before halftime. With impressive willpower, Sheriff pressed the Wolves, fighting hard for every 50/50 ball. They were able to gain a little more possession of the ball, and, in the 39th minute it paid off. After winning the ball in the midfield, a quick attack produced Sheriff's second shot on goal. Caught off guard, the Wolves defense did not close down the attack quickly enough, and the Sheriff forward finished crisply, beating Wolves GK, Peter Lechak from 20 yards out. Going into the half the score remained Wolves 2, Sheriff 1. Wolves played Seattle University this year, too. Disappointed that they had let their opponents back in the match, the Wolves were determined to regain a hold on the match, and cushion their lead. However, the second half started much like the first had ended. Early opportunities on goal for FC Sheriff were thwarted by the Wolves back line of Brandon Sprague, Dave O'Neill, Daniel Scott and Steve Pirotte, and Lechak came up with one key save, which kept the scoreline at 2-1. After defending the initial onslaught, the Wolves got the ball and were able to possess it for the majority of the remainder of the match. In the 67th minute Batres would continue his unselfish ways, putting Conrad on goal again. Conrad finished easily, and was greeted by the rest of his teammates on the touchline, who knew that they had just secured the title. Continuing to keep possession, Batres added a well-deserved goal of his own in the 81st minute to cap off the 4-1 scoreline. A penetrating run with the ball down the right flank by fullback, Brandon Sprague, produced a low, driven cross that found Batres on the back post. 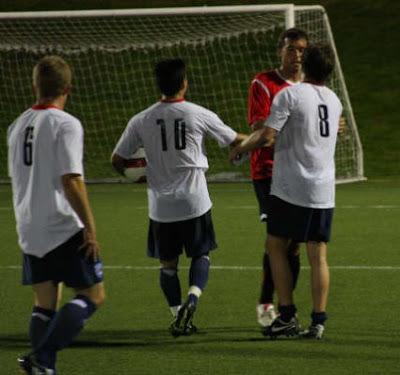 With this win, the Wolves finished the Fall 2008 SPSL Premier campaign, 9-0-3 in all matches, outscoring their last four opponents 38-3. 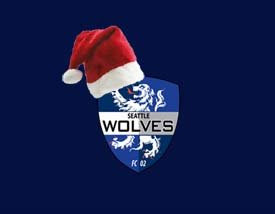 After two more weeks of training and upcoming friendly matches with the Sounders and Pars FC from the GSSL, the Wolves will be on holiday break until January 4th. If Sounders tampered with Schmid, does it matter? Send us your Sounders gear photos!